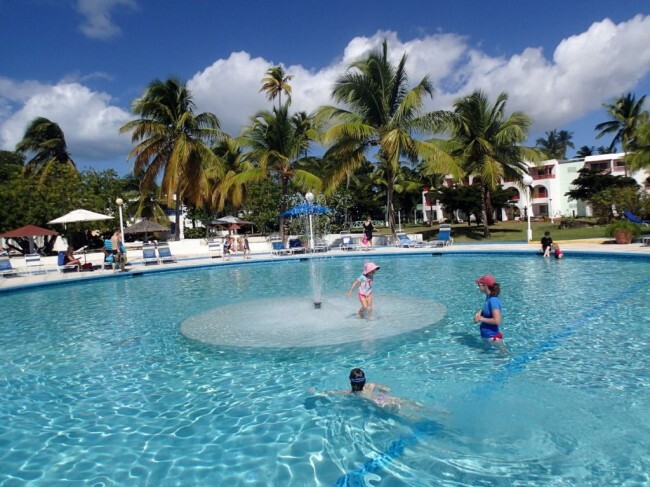 We stayed at the Jolly Beach All-Inclusive Resort, in Jolly Harbour in Antigua. It was a fabulous deal for our family, especially over the peak Christmas period. The resort was a little rough around the edges – but overall we had a great time. The food was good, the fantasy pool was huge and great for kids, and we really enjoyed the beach as well. The complex is very big – it sprawls over a large amount of ground, but the grounds are very well taken care of and we never minded the walk back to the room. The pool was truly massive. There was always lots of space for our kids to play. The resort food was very good for a lower-end all-inclusive. There was even several “a la carte” higher end restaurants, with dress codes, which we enjoyed. (although there is a limit to the number of times you can go, so we ended up mostly in the buffet). The Christmas Day festivities were well done and our kids really enjoyed it. Santa arrived by motorboat, jumped out onto the beach to hug all the kids, and gave out small presents to the kids. We’ve been to several resorts at Christmas time, and this was probably the best done. For New Years, they had a good band, and some questionably safe fireworks being launched from the roof of the hotel.